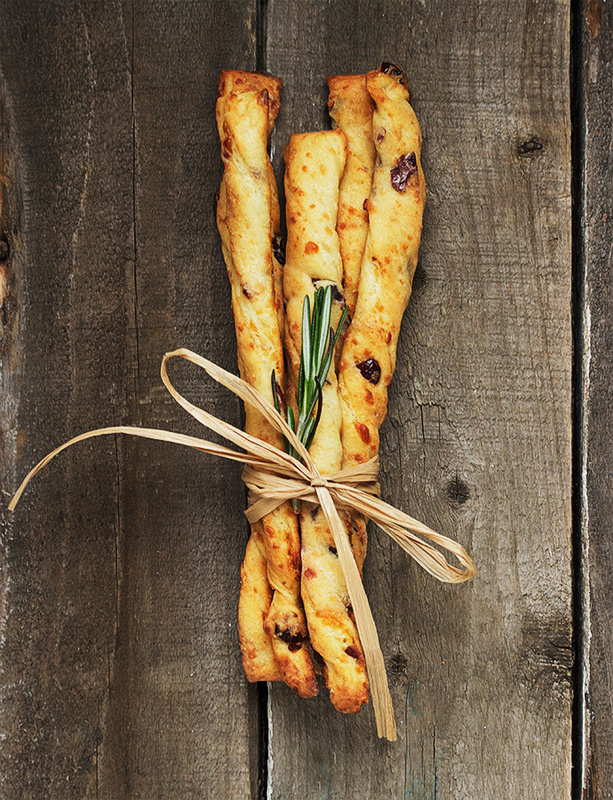 Delicious bread sticks, full of cheese and dried cranberries. Perfect with a glass of wine, as a gift or just for snacking. In a large bowl or the bowl of a stand mixer fitted with a kneading hook, add warm water and sugar. Stir. Sprinkle with yeast and allow to stand for 10 minutes until foamy. Meanwhile, grate your cheese and set aside. Chop cranberries with a sharp knife in to smaller pieces and set aside. When yeast is ready, add flour, salt, vegetable oil and Dijon mustard. Knead well, adding a bit more flour, if necessary, until your dough comes together (it will still be a bit sticky at this point). Sprinkle in cranberries and mix until combined with the dough. Repeat with the grated cheese. Remove dough to a floured surface. Knead, adding a bit more flour as necessary to prevent it sticking to the surface, until dough is soft and smooth. Place dough in a greased bowl, cover with plastic wrap and set aside to rise until doubled, 60-90 minutes. When dough is risen, remove to a large floured surface. Roll dough in to a 10 x 15-inch rectangle. With the short side closest to you, slice in to 3/4-inch wide strips from top to bottom. When all the 3/4-inch long strips are cut, make one cut across the middle from right to left, cutting each of the long strips in half. You should have approximately 28 strips that are 3/4-inches wide by 7 1/2-inches long. Preheat oven to 350Â° F. with oven racks in top third and bottom third of oven. Line two baking sheets with parchment paper. Take a strip of dough and holding both ends, twist in opposite directions, to twist the dough. Place the strip on a baking sheet, lightly pressing the ends in to the baking sheet to hold it in place. Repeat with the remaining strips, distributing them between the two baking sheets. Cover trays with a tea towel and set aside to rest for 15-20 minutes. When dough has rested, place one tray on the top rack and one on the bottom. Bake for 8 minutes, then rotate pans from top to bottom and front to back. Continue baking for another 8-10 minutes (16-18 minutes total), until lightly golden. *BE SURE TO WATCH CLOSELY IN THE LAST MINUTES OF BAKING, AS THEY GO FROM GOLDEN TO BROWN VERY QUICKLY! Remove baking sheets from oven and immediately remove bread sticks to a cooling rack. Store in an airtight container.